RuBisCO plays a key role in photosynthesis and is one of the most abundant enzymes in the world. A Japanese research team has revealed how charge distribution on RuBisCO's active sites is linked to the enzyme's ability to recognize carbon dioxide. This discovery can potentially be used to improve the carbon dioxide-fixing ability of RuBisCO, which could boost photosynthesis rates in plants, increase food supplies and lower carbon dioxide emissions. The findings were published on February 28 in Biochemical Society Transactions. This joint research was led by Associate Professor Hiroki Ashida (Kobe University Graduate School of Human Development and Environment) Professor Emeritus Akiho Yokota (Nara Institute of Science and Technology) and Associate Professor Eiichi Mizohata (Osaka University Department of Applied Chemistry). RuBisCO (short for ribulose 1,5-bisphosphate carboxylase/oxygenase) is responsible for catalyzing carbon dioxide-fixation in photosynthesis, the process which converts CO2 from the atmosphere into sugar and carbohydrates. However, it is not an efficient enzyme – it sometimes mistakes oxygen for CO2, and ends up catalyzing oxygen as well as fixing carbon dioxide. This poor discrimination of CO2, combined with the high concentrations of oxygen in the Earth's current atmosphere, severely limits the CO2-fixing reaction. RuBisCO's poor performance as a CO2-fixing enzyme restricts the photosynthetic capacity of plants and algae. Interestingly, RuBisCO's ability to recognize CO2 differs depending on the photosynthetic organism. 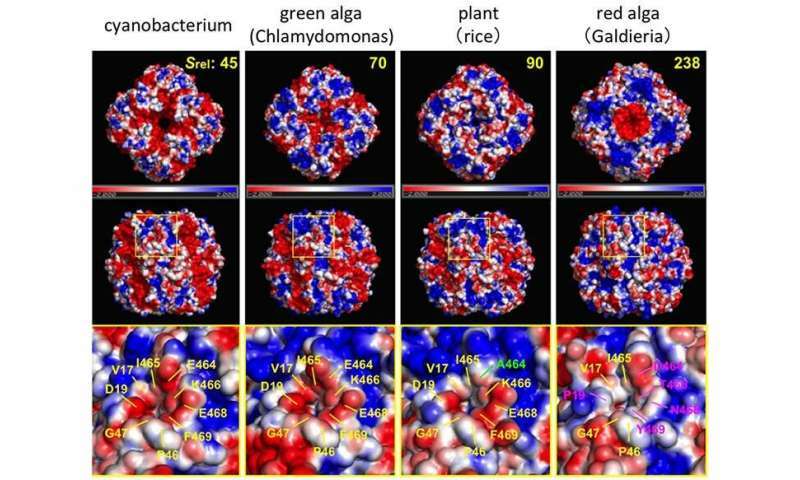 RuBisCO's CO2 recognition improves for organisms in the following order (low to high): cyanobacteria, green algae (Chlamydomonas), plants (rice), and red algae (Gardieria). The CO2 recognition values for RuBisCO in green algae, plants and red algae are respectively 1.5 times, 2 times and 6 times higher than that of cyanobacteria. To shed light on what causes these different CO2 recognition levels, the team carried out a detailed analysis and comparison of the 3-dimensional structure of different RuBisCO enzymes. After analyzing the charge distribution on the surface of the active sites of RuBisCO, they found that the active sites showed a minus charge in RuBisCO with low CO2 recognition, while the charge tended to be neutral in RuBisCO with high CO2 recognition. In general, structures and sites with a neutral charge have low binding affinity with oxygen. From this, it became clear that charge distribution on the surface of the active sites of RuBisCO is the deciding factor in the relative abundance of CO2and oxygen near the active sites. CO2 concentrations are higher in RuBisCO with neutral charges on active site surfaces, so these types demonstrate superior CO2 recognition abilities. Until now, researchers have attempted to improve the CO2 recognition ability of RuBisCO with the expectation that this would improve photosynthetic abilities in plants, but they were not sure what sort of RuBisCO to design. Based on this new finding, we can create RuBisCO with a high CO2 recognition ability. We hope this can be applied to improve plants' photosynthetic abilities, increase food supplies, lower CO2 levels, and accelerate production of alternative fuels.